I don't give a lot of single star reviews because I'm usually pretty sure going in that I'll probably like the story at least a little. 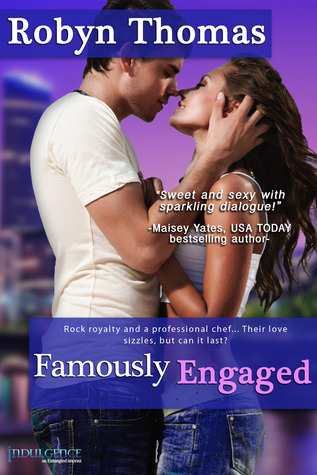 FAMOUSLY ENGAGED sounded like a fun concept, who doesn't like chefs and rock stars as protagonists? Alas, the plot is so contrived and the relationship so forced and lacking in chemistry I almost didn't read beyond the first few chapters. Beth is of the romance heroine type known as the too-stupid-to-live heroine. She, quite literally, just welcomes a stranger into her home without immediately recognizing that he's pretty much the most famous rock star in the world. Seriously? Jake, on the other hand, goes halfway around the world on some hare-brained scheme because he's heard so much about Beth and thinks his secret half-sister is possibly being cheated on. In the blurb it's vague enough to be passable but in execution it's really bad. There is no chemistry between Beth and Jake. Every thought they have about the other feels like it was placed there to further the plot, not the organic flow of real-ish characters. Add in ridiculously cheesy secondary characters, Beth getting bowled over by everyone around her, and the fact that her mother just died... yet she can move right on with a stranger within 24 hours of the funeral? No. Just no. The only thing I wound up liking about FAMOUSLY ENGAGED is the cover. Looking for a great read featuring a chef or a rock star? Try Gina Gordon's A TASTE OF TROUBLE or RECIPE FOR SATISFACTION for chefs (which both earned high ratings from me) and Olivia Cunning's Sinners or Sole Regret series (which, in full disclosure, I haven't read but have great reviews from my blogger friends) for rock stars.